The Royal Air Force #175 16.9.86. Item Condition: All mint in cellophane. Information Technology #138 8.9.82. Mint in original plastic wallet. Compensation for the ‘Signed For’ service is limited to a maximum of £50. THE SMALL PRINT. 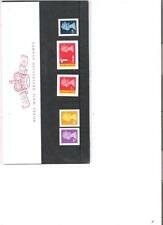 Royal Mail 1988 Presentation Pack Definitive Pack No 18 (1 to £5) Castles Mint . Dispatched with Royal Mail Signed For 2nd Class Large Letter. Packed with stiffeners. No added postage on three or more items. I am selling my complete collection. Compensation for the ‘Signed For’ service is limited to a maximum of £50. 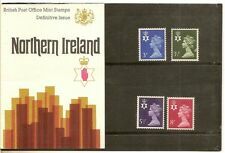 Northern Ireland Definitives 2001 - Presentation Pack No 53. All 4 stamps present and MNH. Excellent condition. Dispatched with Royal Mail 2nd Class Letter. TYPE "B" - UNICORN WITH TWO TUFTS. TYPE "A" - UNICORN WITH ONE TUFT. Royal Mail Stamp High Value £10 Definitive Presentation Pack no.28, 1993. Dispatched with Royal Mail 2nd Class Letter. Collectible little item. ::: UK Cover Lover :: Plus save at least 10% in our monthly sales. Dedicated Support.